Peel the ginger, garlic and remove the hard stalk ends on the mint and coriander. Beat the egg in a little bowl. In a food processor, whizz the ginger, garlic, fresh coriander and mint together with one quarter of the mince and half the egg. You want to grind the meat to a creamy smooth paste. Then remove this into a large mixing bowl and blitz another quarter of the meat with the remaining egg. Now, add in the remaining meat in the mixing bowl with the spices and salt and go in with your fingers mixing the whole lot. You want the ground meat and the mince to integrate well together so no one notices that you cheated by not grinding half the mince. Cover this bowl and chill for about an hour or more if you can. I had a quick beauty sleep. When you’re ready to go, dampen your hand and divide the mixture into 15 even size lumps. A moist hand will prevent the mixture from sticking to your hands. Then take each lump and shape it like a sausage around each skewer. Keep wetting your palm to make this process really easy. mmmmm…feel like eatin now,..cAN I PREPARE THIS WITH CHICKEN MEAT.? You are giving a different dish with very very simple ingredients, looking good, and very easy to prepare. Thank you, Bye…. Ooooooooooh Mallika…what fun. Wish I had a ra ra skirt (mini would drive the crowds away if they saw me)LOL…I would have come too. Love the look of ’em kebabs. Tell me, have you ever tried these without the egg? I’m quite a non-eggy person. I’ve made chicken seekhs without eggs 7 they seemed to hold up fine. Those kebabs sound so good I’m surprised you wanted to to share them. The more for you, the better! Those kebabs sound so good I’m surprised you wanted to share them. The more for you, the better! 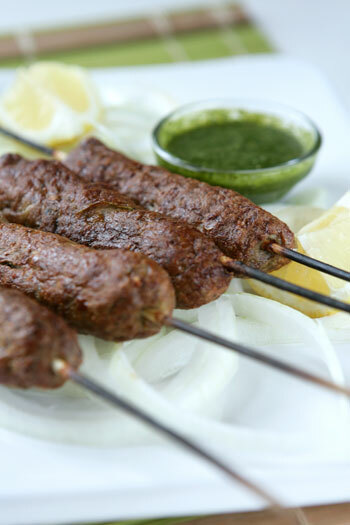 Deeba – I would suggest two tablespoons of flour or cornflour to hold the kebabs together. But then you’ll need a pretty amazing food processor to grind the dry meat together. Smithz – The chilling part is really important. If you can keep the meat mixture in the fridge for 1-2 hours. If it’s still troublesome then floor (as above) is your answer. But to be honest, mine came out just fine at the first go! Maybe you should try this recipe. Christie – Ooops. I couldn’t think of anther City in Australia beginning with M. Any suggestions? I once made a Sikh kebab by sticking a skewer into my Indian friend. there’s a great turkish kebab place we should all go to up in stoke newington…..
the kebabs look delicious mallika, I would have sneaked a few myself!